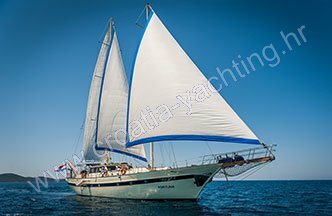 Fortuna is a beautifully schooner with perfect sailing abilities. With its shape and performance, she could sail comfortably in almost any condition and with its various water toys, your summer time could be spent in fun and sea exploring activities. She offers covered aft deck with dining area and large sun-deck for sun-bathing in lazy afternoons.